Do we owe our most heinous killers an even more painful death? New York Law School Professor Robert Blecker thinks so and has made a name for himself, researching convicted killers, executions and testifying in numerous states considering the death penalty. He also believes that convicted murderers who get life without parole often end up in relative comfort in which there are "joys and satisfactions" that the worst of the worst "don't deserve." It's possible to think that Blecker is some sort of double agent. But that isn't so, Blecker assured me in a phone conversation Wednesday in which he emphasized our moral obligation to the death penalty. What he wants is retribution. "Some people deserve to die, and we have an obligation to execute them," said Blecker, who will testify Monday when the General Assembly begins hearings on repeal of the death penalty. His goal, he said, is "a more morally defined death penalty for Connecticut." On Thursday, he will tour death row and maximum-security prisons in Connecticut at the request of House Republican Leader Lawrence Cafero. 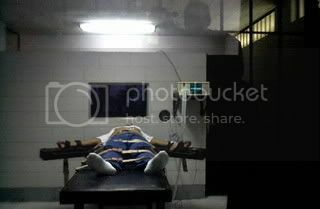 Blecker, Cafero said in a letter to Correction Commissioner Leo C. Arnone requesting access, "must be able to document ... daily life in the least restrictive correctional setting a perfectly well-behaved non-gang affiliated convicted murderer sentenced to life-without-release could realistically end up in." Blecker told me he knows "intimately what life is like" in other prisons. He said he wants to see if conditions are the same in Connecticut for convicted killers serving life without parole. A correction department spokesman told me that Blecker will be taken to three facilities. My request to tag along was denied. His positions can enrage the left and right. Becker would limit the cases in which a cop killer gets the death penalty -- but he wants to make executions more painful. An "emotional retributivist,'' he frequently pops up in death penalty debates throughout the country. In 2009, an award-winning film documentary titled "Robert Blecker Wants To Kill Me" featured his relationship with a condemned man in Tennessee. "The time has come to reaffirm the inseparable connection of crime with punishment, and punishment with pain,'' Blecker wrote a few years ago. Blecker told me he was concerned with the question of whether killers receive the punishment they "morally deserve." Punishment and the accompanying pain and suffering, Blecker believes, must be proportional with the seriousness of the crime. "I'm not advocating torture,'' he said. "It's all about human dignity. I'm someone who has taken this issue very seriously." Blecker's idea of punishment -- or "retribution'' -- seems a lot like torture to me. But he is willing to annoy supporters and opponents in this divisive debate, so give him some credit. We should all listen if we are going to have a deeper, more honest discussion of the death penalty.